Overview: Crocosmia refers to the genus of flowering plants. These plants are native to the land of South America. Though, they are officially called Crocosmia,they have other nick names like Coppertips and Montbertia.Crocosmia comes in a wide array of shockingly bright, attractive hues.The flowers have a peculiar funnel-shaped appearance which is admired. The foliage of this plant is attractive too. The leaves are grass-like - thin,silky and long. These flowers are very popular choices as cut flowers. This is again due to their attractive hues and long stems. This flower variety is widdely used in bouquets and other indoor vessels. Species: Crocosmia 'Lucifer' is the most famous and sought after speciesof the genus Crocosmia Its flowers are very attractive. The flowers of Lucifer are very strong. They are big and wide and bright hued.Crocosmia mathewsiana are found in the wild regions in Africa.The main feature of this species is that it grows to become as tall as eight feet. It also has many many branches. This species are found in the wild jungles of Africa besides very tall trees..Crocosmia pearsei is a wild plant that can not be bred in small cages like gardens.They are not found in other places like in flower beds or borders or as cut flowers.Crocosmia paniculata are usually found in Africa. They naturally grow in the borders of any water body. The water body may be streams, lakes, oceans,rivers or small rivelets. Crocosmia masoniorum is a species which was almost extinct once upon a time. However, later the flower is known to be famous worldwide.The flower of this plant is dark orange in color. Outdoor plantation: Crocosmia is loves sunlight. Thus, it should be planted in an area where sunlight falls all the time, from sunrise to sunset. Crcosmia however does not grow well in soggy areas. Thus, Crosmia should be planted in an area where the soil has a good drainanage system. If the drainage system (the capacity of water to escape through the soil) of soil in your garden is not good enough then there are solutions for it. One can alter the level of soil drainage by adding organic mass in the soil.The organic mass must be added in such a way that the mass is about two or three metres thick in height. There are many examples of organic moss for instance, home made stuffs like the dried hay (peat moss) or even the recycling of all the natural products (compost manure). The crocosmia bulbs can be found in stores. One should be careful when buying them and not choose bulbs that are smelly, wet or have all unnatural tiny black spots in it. In addition,one should be very careful with the Crocosmia bulbs as they might be dameged an unable to sprout if a pressure is put on it. The point in the bulb from where the plant starts sprouting should not be touched. These bulbs should not be dropped inground and must be taken good care of. A hole of about two and a half inches should be dug in the soil and the bulb should be kept in it. The bulb should be kept in the hole in such a way that the sharp, edgy are of the bulb turns upwards towards the sky. As soon as the bulb is planted, the bulb is planted, water should be added to the spot of plantation. Crocosmia can take more than three weeks to sprout if the temperature of the place one lives in is pretty low. Usually it sprouts in a couple of weeks. Once the flowers begin to ripe, the garden will look more beautiful than ever. However, if you want to pluck the flowers from the plant in order to keep them in vases or other places, you may happilly do it for that does not the affect the health of the plant at all. When the flowers stop blooming, the leaves of the plant should be let to grow naturally The leaves should not be plucked or removed. After some times there comes a time when the leaves become dry and wither.Only after than can the leaves be taken off the foliage. Indoor plantation: The Crocosmia can bloom just as effectively inside a building as it does on the outdoor gardens. It is pretty easy to grow them indoor.One must have a vessel which can be litterally anything, homemade or bought on shopsas long as it concists of holes. Now once one has a vessel, it should be filled with soil that has a high drainage quality.One should not compromise with the drainage capacity of the soil or the Crocosmia willnot sprout at all. Once the soil is set up in the vessel, the Crocosmia bulbs should be put in them. The bulb must be planted abot two and a half inches deep and every consecutive bulb in the pot should be planted with a gap of about eight or more inches.The bulb should be kept in the hole in such a way that the sharp, edgy are of the bulb turns upwards towards the sky. As soon as the bulb is planted, the bulb is planted, water should be added to the spot of plantation. Crocosmia can take more than three weeks to sprout if the temperature of the place one lives in is pretty low. Usually it sprouts in a couple of weeks. If you want to pluck the flowers from the plant in order to keep them in vases or other places, you may happilly do it for that does not the affect the health of the plant at all. When the flowers end sprouting, the foliage should not be plucked off. 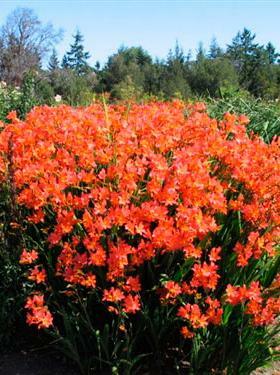 The Crocosmia plants can be used in flowering beds. They are abundantly used as borders too.Some species of the They are also massively exploited as flowers in bouquets and vases. The different attractive hues and the long stalk is the reason for its massice use in bouquets. Crocosmia plants are known to have few homeopathic uses too. Crocosmia comes in different shades of very attractive hues. This causes some birds, especially humming bird to come to the garden where the flower idly lies. Thus, the flower can be used by a person who likes to watch such birds.Some species that belong to Crocosmia are despised by animals like rabbits.Thus these plants are exploited in places where these animals are unwanted. Insects and Disease: Crocosmia is almost invulnerable to most of the isects and pests. However, some insects, especially the spidermites seem to damage the glory of the plant. These insects though not critically harmful to the plant, can cause some minor problems which does not really affect the flowers that much. These insects target the foliage instead of the flowers. In order to kill these insects on musr add different sorts of chemicals that can be found on drug stores. However, these insects are not really a significant problem.